The viruses that cause cold can survive up to three hours on objects like kitchen counters, door knobs, bathroom sinks, and practically any other surface you could come in contact with. So make sure you wash your hands thoroughly with soap and water before handling food or cooking, in order to prevent it from spreading to someone else. Cold is caused due to a viral infection. Antibiotics don't help in curing cold. So avoid popping one the minute you have a runny nose. Leaving your hair wet for long periods of time will not make you catch cold. Germs cause cold; not the wetness. 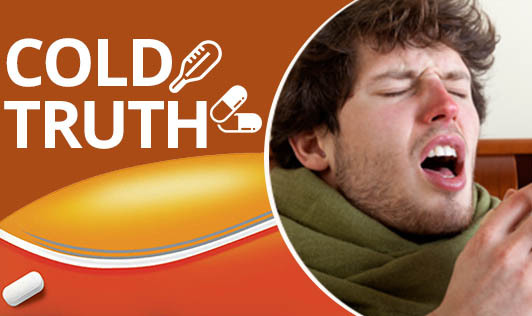 Cold weather is not the reason for you to catch a cold. It is simply because air during winter is drier and low in humidity and viruses can survive better in such conditions. An over-the-counter drug for kids below 4 years, for cold is obsolete and unsafe. You rather hydrate him well with plenty of fluids and limit him to the couch. If you are under severe stress, you are definitely more vulnerable to infections. Get out of the house and start exercising to be fit. Do not panic if the mucus changes color when you have a cold. They are bound to change color and turn green when the harmless bacteria in your nose grow back. There are more than 200 types of viruses that cause cold. A flu vaccine can only protect you against flu and not cold.